Men and women experiencing problems with gaming machines (slot machines) display the same signs that their habit is out of control. However, the two sexes differ in how they handle the distress that accompanies their addiction. Women tend to be more emotional and more likely to cry or to look depressed when losing. Men may angrily channel their distress into striking or even kicking their gaming machine. 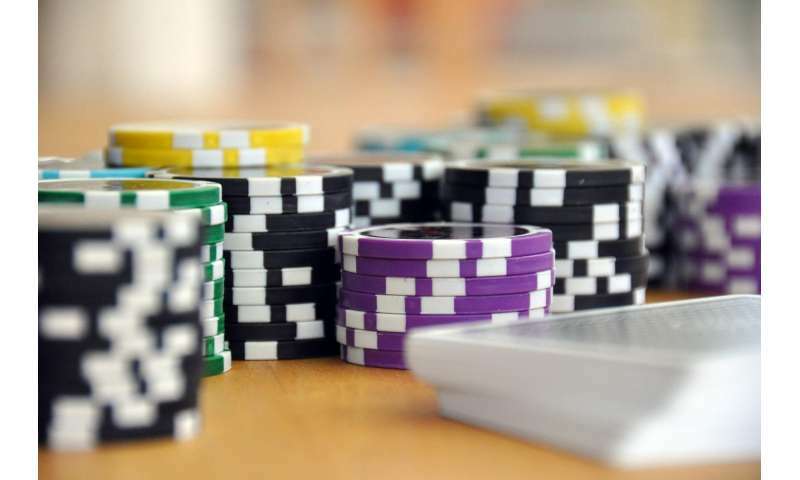 These are the findings of researchers at the University of Adelaide, the Australian Gambling Research Centre (AGRC) and Swinburne University of Technology in Australia. The study is published in Springer's Journal of Gambling Studies. The data used in the paper were obtained from two recent large studies conducted in Australia of regular gamblers. Together the two surveys yielded a total sample of 1185 (580 men and 605 women). Of these, 338 were classified as problem gamblers. Men and women were found to show the same problem gambling symptoms, but some "red flags" of distress were more prevalent among the sexes. Males were more likely than females to report anger and frustration when losing. They more readily displayed aggression in their play, kicking and striking their gaming machines or playing them roughly. They often engaged in territorial stand-over tactics to scare customers away from machines that they claimed as theirs, and could be impolite towards venue staff. Women were much more likely to display visible signs of distress such as crying, or other visible signs of sadness and depression. "Signs of distress are likely to be more commonly seen indicators for female patrons while signs of anger or aggression may be more likely to be observed for males," says Anna Thomas, Manager of the AGRC. Thomas advises gambling venue staff to view any unusual behaviours such as aggression towards machines, attempts to borrow money or ask for credit, or a decline in grooming in female patrons as definite "red flags". "Behaviours that are most clearly distinctive of gambling problems in male patrons included clear and visible signs of distress, asking for loans from a venue and attempts to conceal their presence in venues from family and friends. For female patrons, asking a venue for a loan or a noticeable decline in personal grooming are particular indicators of which staff should take note," Thomas adds. The results more broadly show that the behaviour of female problem gamblers is generally more differentiated from other lower risk gamblers. "This suggests that it may be easier to detect variations in behaviour for female gamblers than for males," says Thomas. "It also means that staff may need to spend more time watching potential male problem gamblers before they can be confident that they are displaying behaviour that is different from other male gamblers." The researchers advise that staff be trained to better identify behavioural indicators, to interpret these as a whole within the greater context, and on how to confidently use such information in their interaction with patrons. Some of this training might include a focus on gender differences and diversity in gamblers. Does new cash-out option in sports betting increase risk for problem gamblers?